Tomorrow Lurks: What City of the Size of Hartford CT Didn't Exist in June 2012? What City of the Size of Hartford CT Didn't Exist in June 2012? This photo was published in the 26 August 2013 issue of the New Yorker. 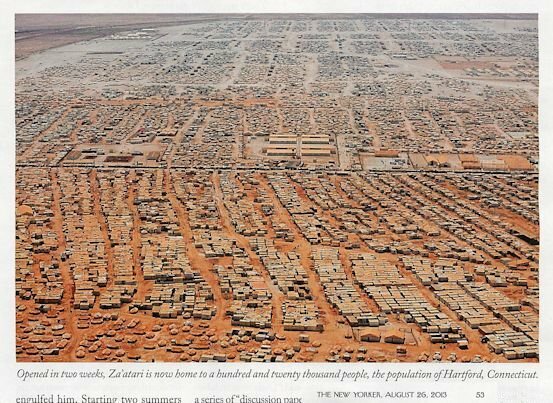 The population of the Za'atari refugee camp in Syria is 120,000 persons -- the population of Hartford, CT.
Photo credit: Moises Saman (credit on p. 49).